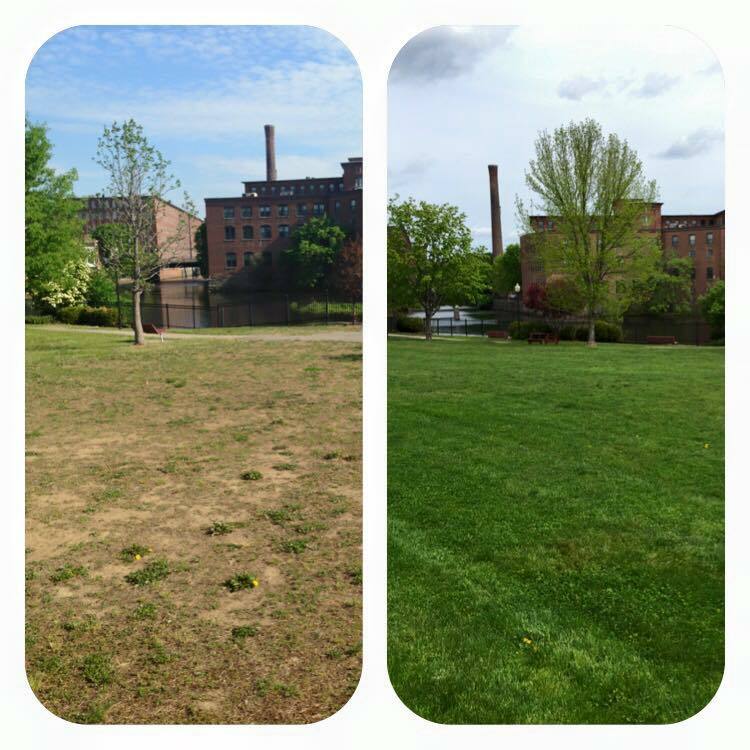 During the winter of 2015, Lawnmark Plus was approached to supply a bid to care for the turf of two sites in the City of Dover using our Organic program. The city had been asked to dedicate two sites to an “organic conversion program” as a result of advocacy to reduce pesticides on public property by several citizens. 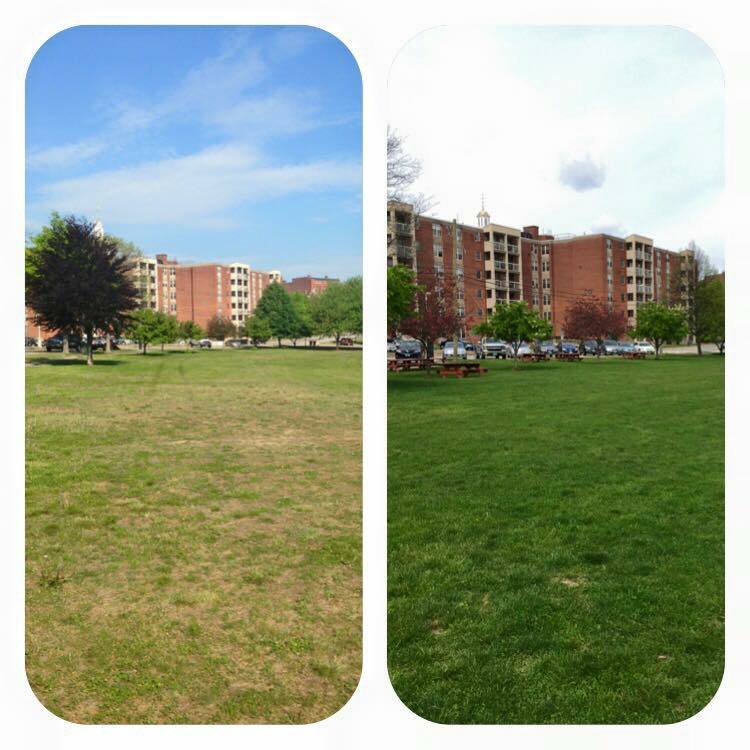 In the Spring of 2015 Lawnmark put forward a a presentation and quote to care for the Turf at Henry Law Park and Sullivan Drive Baseball Field. That original presentation can be viewed here. Henry Law Park is a public green space of approximately 80,000 square feet. It has significant use, is always occupied and had not been cared for in many years. The turf was sparse, the soil was compact, there were many weeds including clover, dandelion and evidence of crabgrass in the spring of 2015. Sullivan Drive Ball Field is a small baseball field that is heavily used. Turf was in fair condition except for several spots in the outfield where soil conditions were causing issues. (Very sandy soil) The thatch in this field was extremely excessive which was causing issues with color as a result of the inability of water and nutrients to reach the root system of the turf. The initial presentation laid out a group of goals and benefits that we would set out to focus on if we were granted the contract. 2.Legitimate input reduction resulting in health and environmental benefits. 3.Drought resistance and irrigation reduction. 5.No loss of quality as a result. We were granted the contract and in May of 2015 began work. What would set our program apart from any other attempt at providing an organic program was that our primary focus was on manipulating soil biology to achieve immediate and drastic results. Unlike any other company, we have the ability to perform biological soil testing and subsequently manufacture a biological input that matches up EXACTLY with the biological requirements of the soil and turf at each site. In the spring of 2015 we completed two bio-assays as can be seen here. After considering the biological foot print of both sites and consulting with our Biological Agronomist we created a custom product that would be used on both sites for each application during the course of the contract. The goals of the inoculant were both site specific and encompassed general biological goals of creating a healthy turf system including nitrogen and phosphorus fixation and solubilization, decrease in turf disease, increase in root development, further protection from environmental extremes such as foot traffic, drought and heat, increased fungal activity to reduce compaction and increased bacterial activity to reduce thatch. Both Sites were fairly poor condition as can be seen by pictures and comments in the first inspection reports completed for both sites. These pictures were taken in the same exact spots in the spring of 2015 and the spring of 2016. After only one year on the biologically intensive program the site had completely transformed from a compact, colorless, weed infested site to dense, weed free, colorful turf. Over the course of the following two years of the contract we continued to see improvements followed by the maintenance of those improvements. The program continued to consist of organic fertilizers, the custom soil inoculant and approved control products. Our initial approach was to implement a program that focused on “Reduction with a means to elimination.” At the request of the city we used a non organic grub preventative called Acelepryn which carries fewer label precautions than the equivalent organic option, Grandevo. We implemented a weed strategy using EPA reduced risk products FIESTA and Tenacity. (Iron and Mesotrione, a plant derivative) All of these inputs were phased out over the course of the contract and if granted the contract moving forward, both sites would require very little, if any inputs to control weeds other than a preventative application of liquid corn gluten and occasional spot treatment of Fiesta or Tenacity. Most importantly, was the elimination of chemical fertilizers being applied to Henry Law. With the pitch of the land directing immediately into the Cocheco River and subsequently the Piscataqua River and Great Bay we were able to reduce and eliminate a quantifiable amount of nitrogen from entering the water. Through out the course of a traditional, chemical program no less than 3 to 5 pounds of water soluble nitrogen per 1,000 square feet would be applied to the turf on this site. This would be a total of 240 to 400 lbs of nitrogen applied to the park and potentially 50 % of it leaching into the river. Over the course of our organic program nitrogen was reduced by roughly 75 % and all sources of nitrogen used were organic and water insoluble. The simple reason that we were able to do this was the intensive introduction of the custom biological inoculant. Overall the the project at the Dover sites was an overwhelming success from multiple perspectives. From an appearance and usability perspective both sites were improved immediately and subsequently maintained. Turf density increased, weed populations decreased, turf disease was not an issue and there was no damage from insects over the course of the contract. We battled an extreme drought in 2016 and did not lose any turf to stress associated with lack of water and heat. Instead we continued to see improvements on both sites. From a public perspective the program was also overwhelmingly successful. When considering the goals we set out at the onset of the program we were successful on all counts. Public Perception: we were able to successfully implement an alternative program that proved to city officials, advocates and the general public that it can be done without the loss of quality and any disturbance to daily operations by staff. As a result a new city ordinance will call for similar inputs on all turf. Legitimate input reduction resulting in health and environmental benefits: Through our philosophy of “Reduction to a means of elimination” we were able to create successful turf without the use of dangerous pesticides and chemical fertilizers. This can also be measured by what was NOT used in the course of the program. 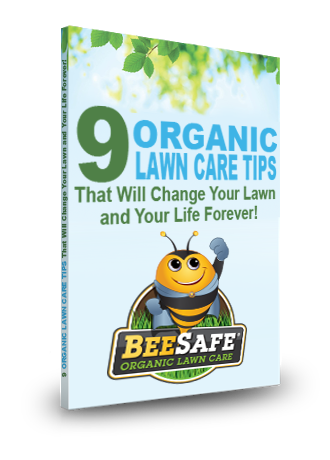 We did NOT use water soluble fertilizers, we did NOT use neonicotinoid insecticides that are dangerous to pollinators and we did NOT use chemical weed controls that include inputs dangerous to children and pets. Drought Resistance and Irrigation Reduction: Even during the “100 year” drought of 2016 we were able to conserve turf quality and continue with input reduction. This is an extremely important point when it comes to higher visibility turf, especially athletic fields. Mowing Reduction: Although we did not speak with any city employees who were responsible for mowing any of these sites, the drastic reduction in nitrogen inputs, by rule creates less surge growth and subsequently a reduction in the amount of mowing that is necessary. No Loss of Quality as a Result: Both sites were transitioned to the alternative program and did not go through any period in which the turf quality decreased. Instead, both sites saw drastic improvements. It is important to note that none of this would have been possible without the extreme focus on the manipulation of soil biology. The addition of soil improving microbes are the core of this process and without this as a primary approach the program would not have been as successful. While we did not complete a soil bio-assay at the completion of the program it is obvious that the addition of our biological inoculant was the key to the success here. We would find that not only did the custom microbes make a difference but that the indigenous species of soil improving micro-organisms have flourished as well. It was a pleasure to implement this process.